Nowadays, if I understand these things correctly, long distance runners rehydrate themselves by glugging lots of water during a race. 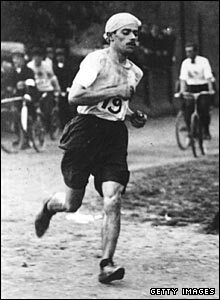 Such namby-pamby methods were alien to the doughty amateurs who ran the twenty-six mile Marathon at the 1908 Olympic Games in London. Among their refreshments along the route were muscatel grapes, calves’ foot jelly with lemon, new-laid eggs soaked in tea, orange segments, brandy, champagne, and small doses of strychnine. I cannot imagine swallowing that concoction! Ah, but we might imagine the eggs to be not so repellent, Commenter Barker, if we assume they were hard-boiled first. Or, by “concoction”, did you mean the entire list, including the strychnine? Then I agree with you.